Skutt kilns need 18" clearance from walls on all sides. Building codes in your area may require more space, heatshielding material on the wall(s) or floor, or other conditions. Be sure to check the code requirements in your area, especially if you're planning or building a new facility. How much firing capacity do you need? What are the dimensions of the largest pieces you make or fire? How many pieces do you plan to fire at once, and how often? Will your firing needs grow in the next five years? To which temperature would you like to fire? What materials will you fire? Glass? Lowfire clays? Stoneware? Porcelain? All the way up to cone 8 or 10? What power supply do you have available? What is your building's voltage, and how many amps are available? 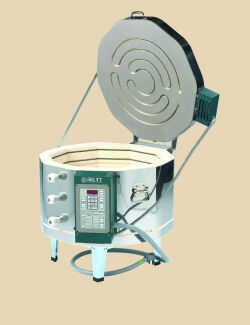 Can you set up a dedicated circuit just for the kiln? 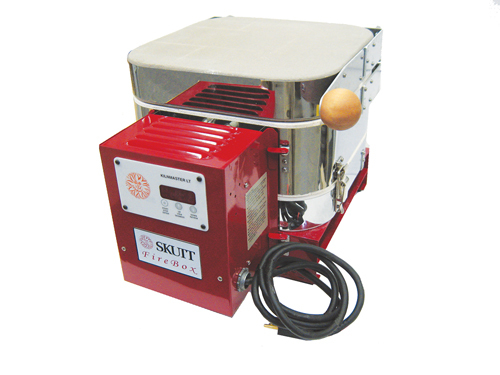 Would you prefer a kiln with electronic or manual controls? 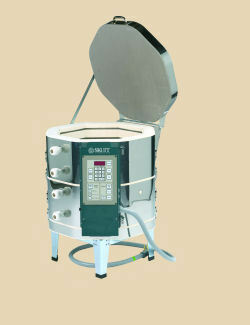 Almost all of the new kilns (especially the glass kilns) we sell at Georgies have Electronic controls. 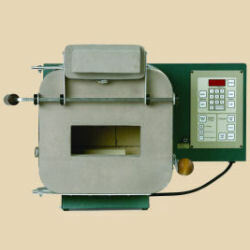 Georgies also offers kilns with manual controls, but they are not listed on this page. Please call or email us to inquire about prices and availability. 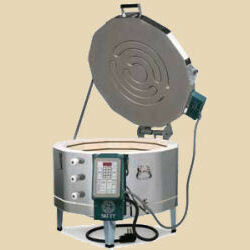 Please note: Our local delivery fee is $100.00 for Large Kilns (*GM1014 and up). For safety reasons, this requires a two person team to move and set up. Please call for delivery charges on smaller kilns. generally it takes about 3-4 weeks. 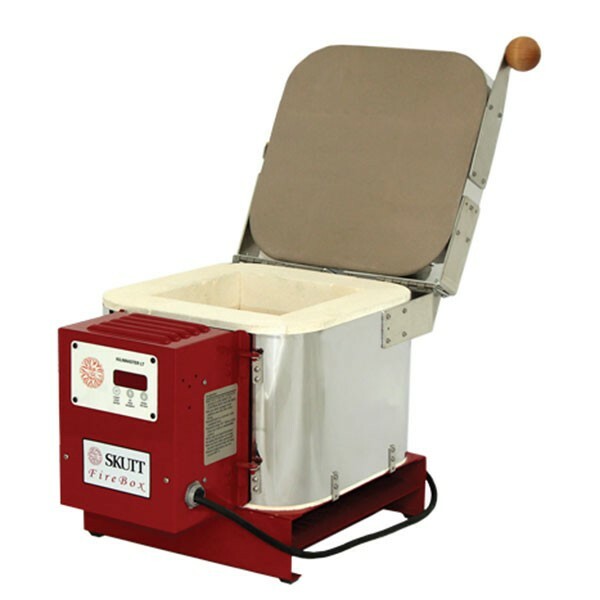 The FIreBox 8 is the perfect small kiln for glass fusing, precious metal clays, small ceramics, enameling, metal or knife making, or almost anything that you need to get hot. Really hot. In a small space. 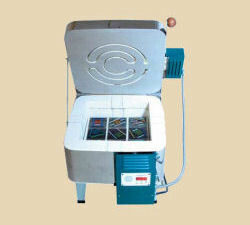 Reaches glass fusing temperature in 20 minutes. Chamber size 8" x 8" x 4.5" (L x W x H). Digital pyrometer gives precise temperature control. Hinged lid opens over 90° with wooden handle. FIREBOX Skutt Firebox 8 Glass Kiln http://www.georgies.com/products/equipment/firebox.jpg Skutt Firebox 8 Skutt Firebox 8 120-volt glass kiln. Georgies price does not include freight or delivery charges to your address. The FireBox 8x4 LT has a GMLT controller that allows you to fire Glass and Ceramics. 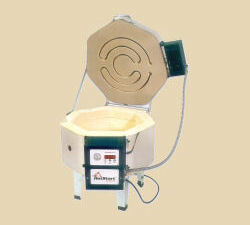 It even has built in programs for Precious Metal Clays. Has the same stay-cool handle as the Firebox 8 and can be plugged into your grounded 120V outlet! Comes with an operating manual. PMC Mode - enter type of clay and press start - it's that easy! Store programs with up to 8 segments. FIREBOX Skutt Firebox8 GMLT Kiln http://www.georgies.com/products/equipment/firebox.jpg Skutt Firebox8 GMLT Skutt Firebox8 GMLT 120-volt glass kiln. Shipping weight is 53 pounds. The FIreBox 8x6 LT comes with the KMLT controller and is the same as the 8x4 only a little deeper for those wanting to use more shelves or taller work. 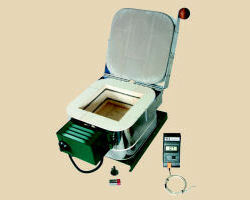 Great little kiln for Precious Metal Clays, Glass and Clay firing. Reaches glass fusing temperature in 20 minutes. Comes with 1 shelf & 3 posts, Kiln Wash, an instructional video and operating manual. FIREBOX Skutt Firebox8x6LT Glass Kiln http://www.georgies.com/products/equipment/firebox.jpg Skutt Firebox8x6LT Skutt Firebox8x6LT 120-volt glass kiln. Shipping weight is 56 pounds. A fully programmable glass kiln that operates on standard household voltage! The GlassMaster LT controller lets you create and save up to 5 custom programs for your firing needs. More memory than any other 3-button controller. Chamber size 15" wide by 6.5" deep. Top mounted element for even heating. Takes a standard 13" kiln shelf. HOTSTART Skutt Hotstart 120-volt Glass Kiln http://www.georgies.com/products/equipment/hotstart.jpg Skutt Hotstart Pro Skutt Hotstart Pro 120-volt glass kiln with computer controller. Shipping weight is 100 pounds. The ease, safety and transportability of the FireBox 8, but with more firing room. The chamber offers enough space for a full square foot of 4x4" tile. Chamber size 14.5" square by 6.5" deep. Reaches max temp of 1700°F. FIREBOX14 Skutt Firebox-14 120-volt Electronic Glass Kiln http://www.georgies.com/products/equipment/firebox14.jpg Skutt Firebox-14 Skutt Firebox-14 120-volt glass kiln with computer controller. Shipping weight is 110 pounds. Equally perfect for annealing torchwork beads or fusing smaller projects. The kiln comes standard with a side-hinged door but can be ordered with the easy-to-open bead door (as shown). Opening 10x9" with interior depth 9". GlassMaster controller standard on this kiln. Hinged lid opens easily with wooden handle. GM10FB Skutt GlassMaster Electronic Glass Bead Kiln with Bead Door http://www.georgies.com/products/equipment/gm10f.jpgSkutt GM10FB Skutt GlassMaster Electronic Glass Bead Kiln with Bead Door. Shipping weight is 82 pounds. The top and side firing elements on the GM814 make it fire very evenly and allows for glass projects to heat at a uniform rate throughout the kiln. Chamber size 13.5" deep by 17.5" wide. GM814 Skutt GM814 Electronic Glass Kiln http://www.georgies.com/products/equipment/gm814.jpg Skutt GM814 Skutt GM814 glass kiln with computer controller. Shipping weight is 132 pounds. With Zone Control standard, this kiln fires each section independently to ensure even firing from the top to the bototm. 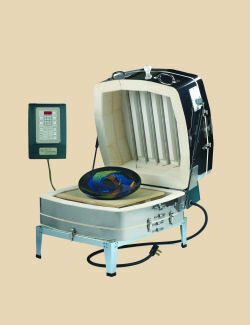 With its chamber depth of 18 inches, this kiln is great for large drop molds and annealing tall sculptural pieces. Chamber size 18" deep by 17.5" wide. GlassMaster controller (with Zone Control) standard on this kiln. 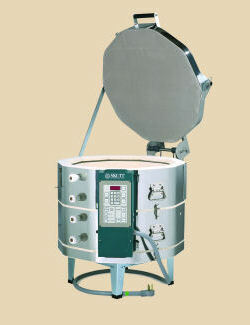 GM818 Skutt GM818 Electronic Glass Kiln http://www.georgies.com/products/equipment/gm818.jpg Skutt GM818 Skutt GM818 glass kiln with computer controller and Zone Control. Shipping weight is 147 pounds. The top and side firing elements on the GM1014 make it fire very evenly and allows for glass projects to heat at a uniform rate throughout the kiln body. Chamber size 23.5" wide by 13.5" deep. Georgies price does not include freight or delivery charges to your location. Shipping weight is 174 pounds. GM1014 Skutt GM1014 Electronic Glass Kiln http://www.georgies.com/products/equipment/gm1014.jpg Skutt GM1014 Skutt GM1014 glass kiln with computer controller and Zone Control. Shipping weight is 174 pounds. With Zone Control standard, this kiln fires each section independently to ensure even firing from the top to the bottom. 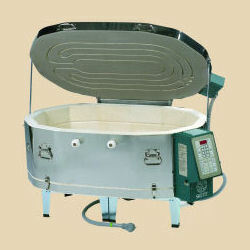 With its chamber depth of 18 inches, this kiln is great for large drop molds and annealing tall sculptural pieces. Chamber size 23.5" wide by 18" deep. 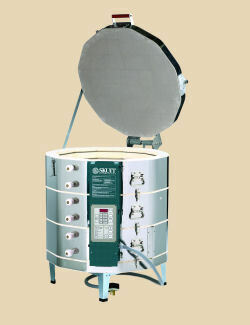 GM1018 Skutt GM1018 Electronic Glass Kiln http://www.georgies.com/products/equipment/gm1018.jpg Skutt GM1018 Skutt GM1018 glass kiln with computer controller and Zone Control. Shipping weight is 196 pounds. A workhorse kiln for glass studios working large: this kiln easily accomodates kiln shelves up to 22 inches wide. Chamber size 28" wide by 13.5" deep. GM1214 Skutt GM1214 Electronic Glass Kiln http://www.georgies.com/products/equipment/gm1214.jpg Skutt GM1214 Skutt GM1214 glass kiln with computer controller. Shipping weight is 275 pounds. With Zone Control standard, this kiln fires each section independently to ensure even firing from the top to the bototm. 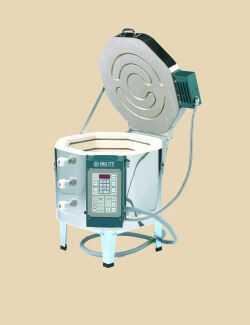 With its chamber depth of 27 inches, this kiln is great for large drop molds and annealing tall sculptural pieces. Chamber size 28" wide by 27" deep. GM1227 Skutt GM1227 Electronic Glass Kiln http://www.georgies.com/products/equipment/gm1227.jpg Skutt GM1227 Skutt GM1227 glass kiln with computer controller. Shipping weight is 351 pounds. For production studios that may need to fire several projects at a time or artists working on large or sculptural forms. Includes the lid lifter; factory installed. Chamber size 41.5" long by 24.5" wide, depth 13.5". GM1414LL Skutt GM1414LL Electronic Oval Glass Kiln http://www.georgies.com/products/equipment/gm1414.jpg Skutt GM1414LL Skutt GM1414LL oval glass kiln with computer controller. Shipping weight is 340 pounds. One of the most unusual kilns you'll ever see in its appearance, but it's the perfect shape for roll-ups or large sculptural or flat work. Chamber size 23.25" wide by 24" long, depth 13.5". GM22CS Skutt GM22CS Clamshell Electronic Glass Kiln http://www.georgies.com/products/equipment/gm22cs.jpg Skutt GM22CS Skutt GM22CS Clamshell electronic glass kiln with computer controller. Shipping weight is 257 pounds.